Coltsfoot plant, Tussilago farafara, is a freely spreading plant with a happy disposition. An ancient Roman folk remedy for asthma and coughs. Leaves are used as a food in soups and salads and also as a poultice to relieve inflammation. The leaf is also an ingredient in many native American smoking mixtures. Bees are attracted to the yellow, dandelion like, flowers. Coltsfoot plant is a native of Europe, Africa and North America. It prefers wet, loamy, limestone based soils in a protected, partially shaded position. Frost resistant but drought tender. 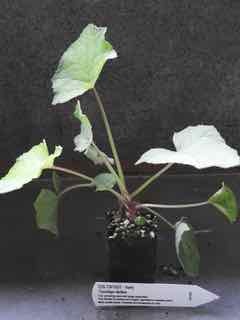 A perennial herbaceous plant, growing to 0.3m x 0.2m. Be the first to review “Coltsfoot, plant” Click here to cancel reply.